Have you had a long week at work? Are you fed up, stressed out or just feel like you need to let out your anger somewhere? Why not take it out on dinner – I’ve got the perfect stress-relieving recipe for you! This recipe’s title may sound intimidating: “Chicken Cordon Bleu,” (so French) but fear not – it’s actually really simple to make. Plus, you get to use a meat mallet! Just use that chicken breast you’re pounding as your personal punching bag. What’s not to like about chicken, ham and cheese all rolled into one delicious package? Sometimes though, the orignal recipe seems a little bland to me, so I add some extra spice for flavor – a little paprika, a little onion powder and for some real zest: Chef Tony Chachere’s creole seasoning. Just enough to really make it wow your mouth. Do you have any secret spices you use to dress up dishes? So if you’re ready to ease your frustrations and make a great meal at the same time, give this chicken cordon bleu recipe a spin. Place chicken breast halves in large zip top bag or between two pieces of plastic wrap, then pound to 1/4-inch thickness using a meat mallet or heavy skillet. Repeat until all chicken breasts are the same thickness. Sprinkle each chicken breast with paprika, then top with one slice of ham and one slice of swiss cheese. Roll up each chicken breast (ham and cheese side in) and secure in place with a toothpick or two. Sprinkle each chicken roll with salt, pepper and Chef Tony’s seasoning for extra flavor. Meanwhile, heat olive oil in a large, oven-proof skillet over medium heat, and add each chicken roll to the skillet. Cook all chicken rolls 3 – 4 minutes, turning occasionally until browned on all sides. Once browned, slide chicken in skillet into the oven and bake for 18 – 20 minutes until chicken is done. Remove from oven, plate and enjoy. NOTE: Be aware of the toothpicks. Chicken in the skillet hot out of the oven. 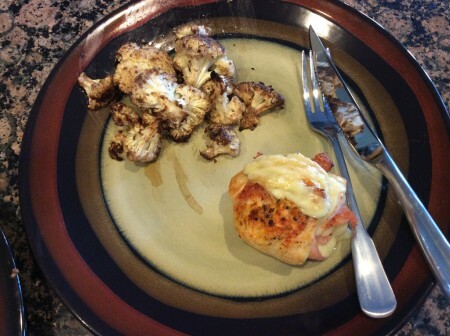 Chicken cordon bleu and cauliflower – it’s what’s for dinner! 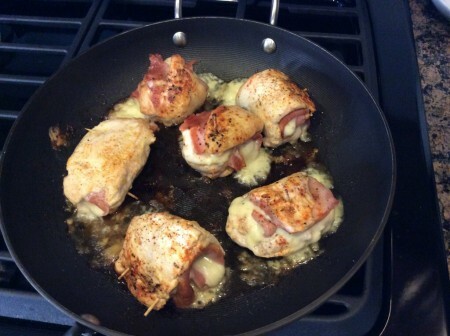 This entry was posted in Entrees, Recipes and tagged Cheese, Chicken, Chicken Cordon Bleu, Entrees, Ham, Recipes on June 27, 2014 by Paige N..